Blade Runner 2049 is a MASTERPIECE! Blade Runner 2049 is a freaking masterpiece! I've seen it twice now and I can confidently say that this is by far the best made movie of the year so far. I really like Ridley Scott's 1982 sci-fi classic Blade Runner. While I don't regard it to be an ultimate masterpiece like many film geeks do; I do think that it is a technical and conceptual masterpiece. When it comes to story however, I think it does have its weaknesses; even resulting in the film being slightly boring. Heck there probably wouldn't be so many versions of the movie if it was as flat-out perfect as some argue. Thus, I think I appreciate and respect it rather than love it. I'd give it a B+ on the Fresnerd scale. Its sequel is a whole another beast. It is a masterpiece in every aspect of a film. Blade Runner 2049 is the kind of movie that inspires a new generation of filmmakers. It is a meditative wonder of deep, layered themes on humanity with a driven story. Despite being a slow burn like its predecessor, the sequences have such purpose and the visuals are so enthralling that your attention is constantly engaged. Every frame in this movie is something that I would love to hang on my wall. IF ROGER DEAKINS DOESN'T WIN THE OSCAR FOR BEST CINEMATOGRAPHY I WILL SCREAM! Not only does this movie succeed in being a great film on its own, but it is also one of the best sequels I've ever seen. This is because it very naturally EXPANDS on the original rather than just retreading. Denis Villeneuve immerses us deeper into both the universe and philosophical dilemmas of the original Blade Runner. He has created a movie that is a feast for the brain, heart, and eyes. THIS IS THE KIND OF MOVIE THAT REMINDS ME OF WHY I LOVE MOVIES! Denis Villeneuve has officially cemented his standing as one of the great directors of our generation. He and Christopher Nolan are my two favorite modern directors and I will loyally and excitedly run to the cinema for every new spectacle they produce. While all the acting is great, I must definitely praise Sylvia Hoeks who amazingly portrays the movie's chief villain. Hoeks hands down steals the show with her controlled intensity. It's really impressive to watch. I would love for her to receive a best supporting actress nomination. Lastly, Hans Zimmer and Benjamin Wallfisch's score is pulsatingly good! It feels both familiar and fresh. Man what a year for Wallfisch! Dunkirk, It, and now this! Despite my praise, I can understand if some won't like this movie due it's very long run time and slow pace. 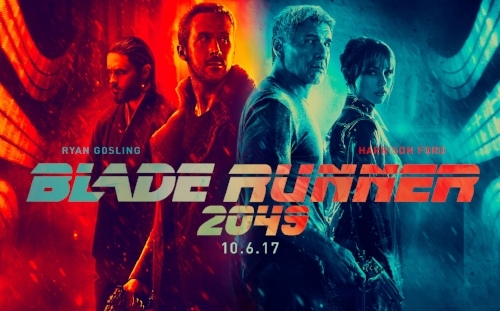 Blade Runner 2049 OF COURSE gets an A+! Oh my gosh I love this movie. What did you guys think? !